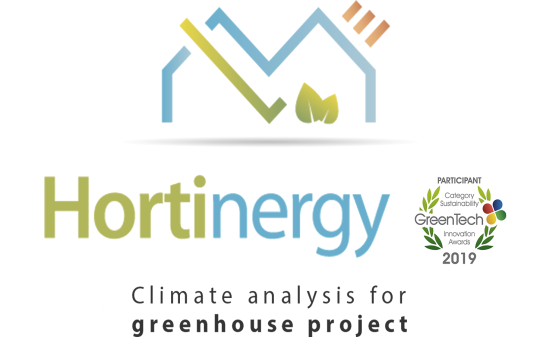 Hortinergy is an online software providing an efficient way to optimize the climate and the energy performances of greenhouses. It allows you to know and optimize energy consumption and expenditure of your agricultural greenhouse projects. In order to help you in your futur choices, we put at your disposal a form that you will have to fill with all the information relating to your greenhouse. Once the form is filled out, you receive a detailed report of the calculated results within 20 minutes according to the data you typed in. An Excel file with daily-based average data for each month. 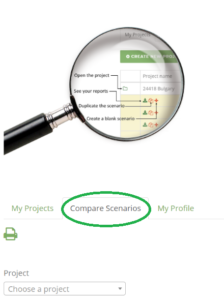 Once you have done several scenarios on a greenhouse project, you can compare these scenarios through our comparison interface. You may compare for example the energy costs between different optimisation or the return on investment. In the first tab, you will have to enter the geographical coordinates of your greenhouse : it will be your “project”. Each variation you make on this project will be a “scenario”. These scenarios can be duplicated identically so you just have to change the parameter you are looking for. All the data are easy to enter in the form, and we give you indications of usual values ​​for each data you have to fill. Remember that if you have any issue with the form, we will be glad to help you out. Keep in touch with us either by e-mail or phone ! Enter the geographical coordinates of your greenhouse in order to locate it. 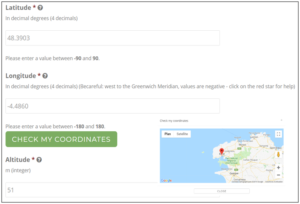 You can check if these coordinates are correct simply by clicking on the button “check my coordinates”. This will open a map with a mark on where your greenhouse is located. Regarding meteorological information, we are getting back the precise data we need. Choose your type of greenhouse through our drop-down list, and enter its orientation and dimensions. Different parameters allow you to note the characteristics of your greenhouse, such as the number of chapels and their length. 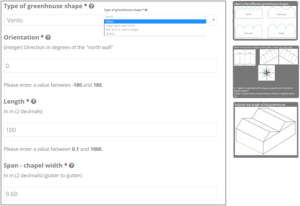 You can quickly choose your roof type with our large library. More than twenty roof cover are registered. 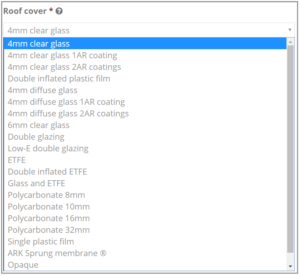 It goes from single plastic layer to more complicated cover such as 4mm diffuse glass 2 AR coatings or ETFE technology. 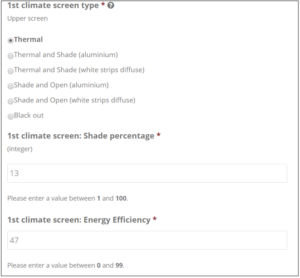 Further on, if you have one (or more), you can choose your screen type from our list, and set its characteristics. Up to three horizontal screens can be added to the settings of your greenhouse. Quickly fill in your agricultural production from those listed. You can choose between: tomato, cannabis, cucumber, cut flower, strawberry, salad, pot plant, seedlings and pepper. Others will be added soon! 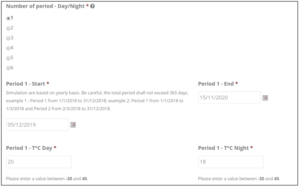 You can enter the same parameters as those of a climate computer, for example day and night set temperatures for different periods of the year. 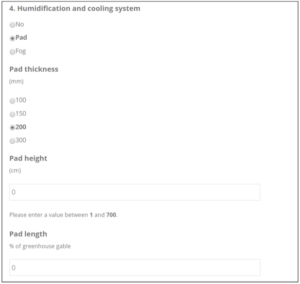 Hortinergy calculates controlled ventilation, humidification and cooling needs for semi-closed greenhouse. 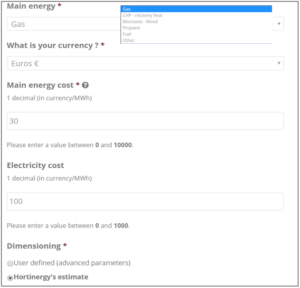 To simulate the energy consumption cost of your greenhouse, you can enter the type of energy you are using to heat up your greenhouse, and the currency of your country. The report is sent to you about 20 minutes after you submitted your form. It is available in PDF format, easy to download. You can see below examples of tables and charts in the report. You will find in the report the costs and energy consumptions of your greenhouse, detailed in your currency, but also the heating consumption of your greenhouse month by month. Check the graph of the solar radiation on your greenhouse to see the evolution of solar radiation and photosynthetic radiation reaching the canopy. Detailed charts of the indoor climate on typical days for different months of the year give you the opportunity to compare solar radiation, indoor temperature or evapotranspiration of the canopy. We also offer the possibility to see in kW the heating demand of your greenhouse for an average day each month. 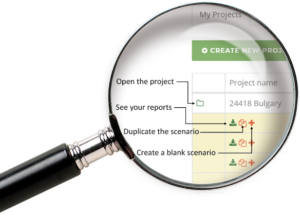 Thanks to the comparison interface, you can compare different scenarios that you have created from a greenhouse project. 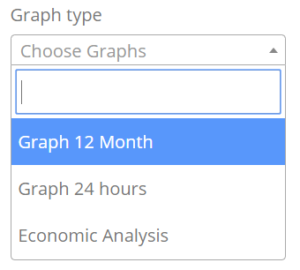 You can choose between 12 months or 24 hours charts with different comparison possibilities. For example, here is the heating power on an average day in January graph, depending on the number of screens. 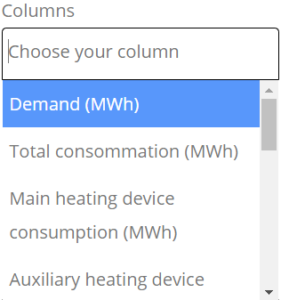 Moreover, you may also choose to compare different columns on the same graph. You can also proceed to an economic analysis in relation to your greenhouse project. Ready ? Let’s give a try !